Ok, so maybe it wasn't inevitable. Despite dominating play throughout the tournament and having more than 2x the chips of his nearest competitor at the WSOP-C Tunica final table, Matt "Allinat420" Stout did not walk away with the title. The win instead went to Kai Landry of Biloxi, Mississippi. 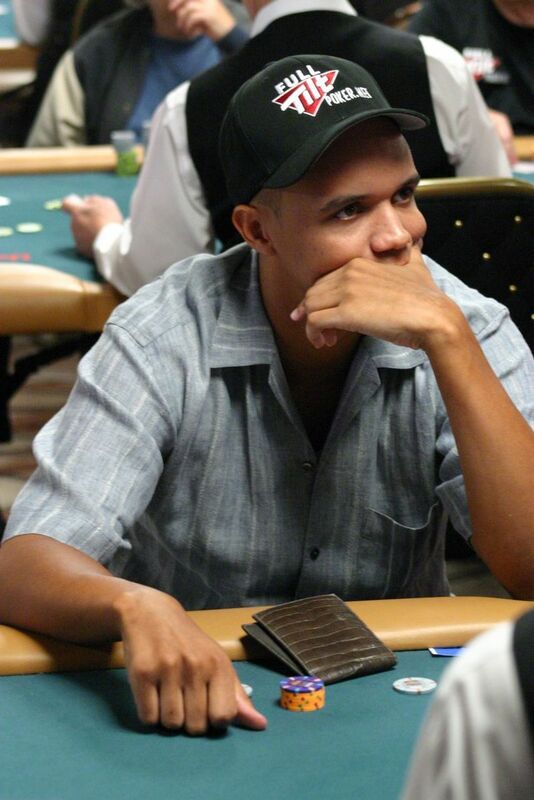 Kai banks $183,974 for his first major cashing plus an entry into the 2009 WSOP Main Event. David Dao finished second, and the aforementioned Stout burned out in third. 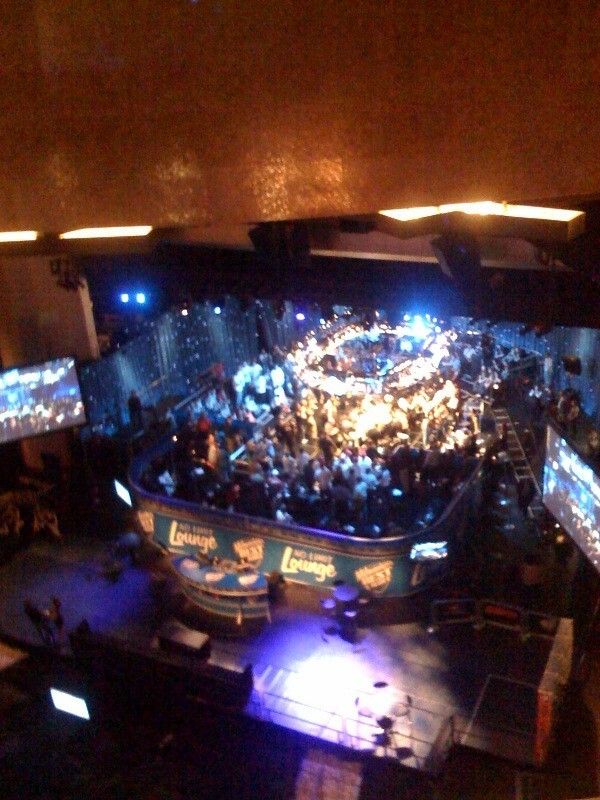 Get full final table results and payouts here. Like Tomer Benvenisti (what happened to that guy) at an all you can eat buffet, it was utter carnage during Day 2 of the Borgata Winter Poker Open Main Event. Despite the deep stacks, the field dropped from 719 to 172. However, they are still 100 away from the money bubble. Still alive is WCP Reader Appreciation winner, Grant "U2KILLERS" Coombs. Although he hasn't see TT, JJ, QQ, KK, or AA in two days of play, he's still sitting with 28 big blinds at 233,000. Read his Day 2 recap here. Some big stacks include Frankie Flowers (847,500) and David "Bakes" Baker (798,000). Bill Edler is also still alive but we don't have his chip count. We blame that on the Russians. Get a full tourney recap here. UPDATE: The money bubble burst and Grant "U2KILLERS" Coombs has officially cashed, turning his WCP freeroll win into a minimum $4,882 payout. With 100 remaining, Coombs is stacked around 500,000. UPDATE II: Coombs just got knocked out after the money bubble burst. He got all in preflop with KK vs. TT, and a ten hit on the flop. Brutal. Live poker is rigged. Still an impressive showing, doing WCP proud. WCP Reader Appreciation Freeroll winner Grant Coombs, at right, chatting it up with Hevad Khan. Grant "U2KILLERS" Coombs is killing it at the Borgata Winter Poker Open Main Event, ending Day 1B play among the chip leaders stacked at 159,000. Also still alive with around 38,000 is the hottest girl in poker, Lacey Jones. The 420 people that survived Day 1B will join the 284 from Day 1A for...math math math...uh, a pretty large Day 2. 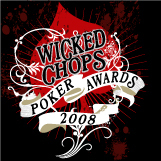 UPDATE: Read some great hand recounts from Grant on his Card Runners blog here. UPDATE II: More than halfway through Day 2, Coombs has 350k. Well, it was still a sick call. 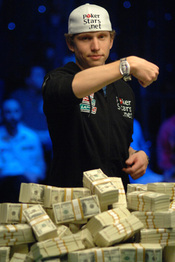 When we picked "David" Chino Rheem to make a deep run in the 2008 WSOP Main Event, most people (like Andrew Feldman at ESPN.com) thought, "who"? 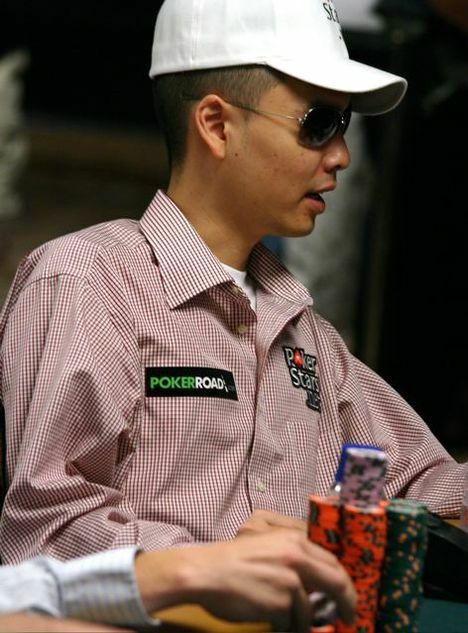 6,800+ eliminations later, Chino, the most experienced pro in the field, was knocked out of the 2008 WSOP Main Event in seventh place. Chino's A-K was sucked out on by Peter Eastgate's A-Q. But thanks for making us look smarter than we really are, Chino. 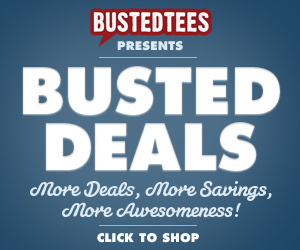 Actually, we're pretty f'in smart, so thanks for validating that. At the dinner break, the chip stacks are: Ivan Demidov 30,725,000, Peter Eastgate 27,175,000, the back in contention Dennis Phillips 26,950,000, Ylon Schwartz 20,475,000, Scott Montgomery 20,300,000, and Darus Suharto 10,600,000.